In today’s computing world, File Servers serve pragmatic purpose by allowing to access data through shared disk access. Workstations attached to a network can access data such as documents, files, folders, images, videos, databases, etc. through File Servers. Thus, they definitely serve as potent sources of data management. But being accessible by a wide range of users, they are equally vulnerable to organizational misuse. Therefore, dedicated File Server Auditing becomes an essential reality to keep issues and data threats at bay. However, to manage File Servers proficiently, we must ensure certain ‘must-to-do things’ while auditing. Perform real-time auditing – Well there is no point of elaborate reports after the damage is done. Ensure that you audit all parameters such as Time, Drive, Directory, File Name, File Type, Process, and Events in real-time. This certainly goes without saying that by real-time auditing; security issues can be averted still in time. Check Compliance – We may audit all that which seems important to best of our knowledge. However, this doesn’t ensure that you can rest at ease. Compliance standards are complex and include numerous clauses. Make sure you to fall in compliance with security standards such as PCI, GLBA, HIPAA, etc. Audit all Changes – Make sure to continuously audit read, write, access (even attempts whether failed or success), delete, ownership changes, and permission modifications for being upbeat with all that is going within the File Servers. Centralized Auditing – It is not only cumbersome but even an unreliable practice to monitor each system differently. Make arrangements to perform centralized auditing which eases you by having a central repository, saves from duplications, and saves time. Long-term storage – It is important to store audit data for a long-term. However, it is not possible with native auditing as data does get overwritten but it is in the best interest to do so. This not only helps to keep a check on previous cases but also helps to draw comparisons and take necessary actions in time. For performing all this, it is definitely painstaking to browse through an ocean of metadata and come to certain conclusions regarding unfair usage and data infringement cases manually. Thus, it may look daunting without the use of an efficient third party application to detect data breaches, notice changes and take necessary steps before damage is done. However, ending up with the right application is equally important; as once installed, the File Server Auditing Software is all that we bother to use for auditing. 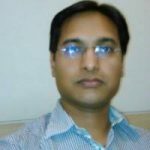 Customizable Auditing – Ensure that the tool of your choice allows you to perform auditing as per your needs depending upon various attributes and objects. 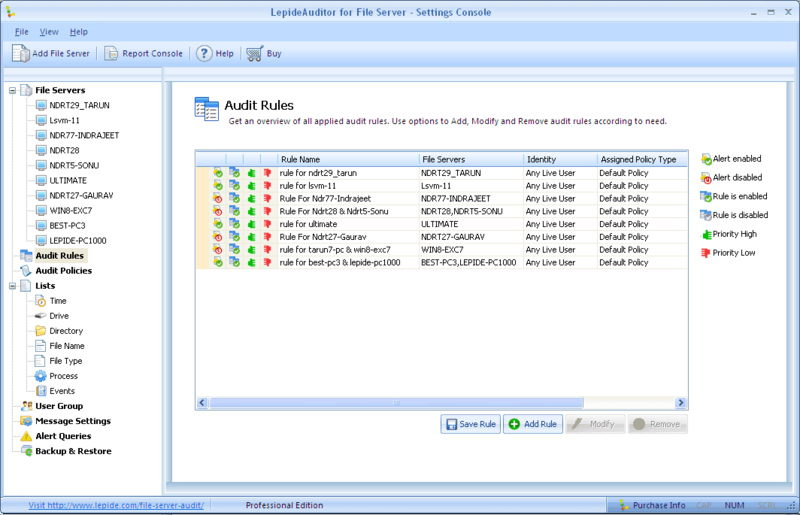 Just like LepideAuditor allows to create own audit rules and enact policies as per your choice. This way you aren’t bound with just the predetermined reports to be generated by the tool. The 4Ws – Gather comprehensive information about Who changed What from Where and When just like Lepide does to have complete information over an event. 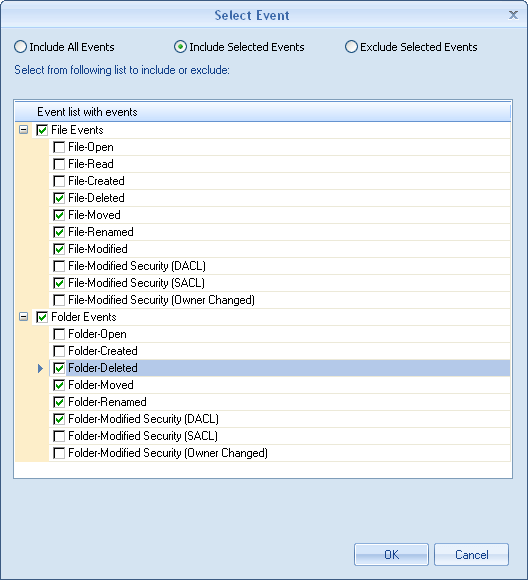 Flexibility – The tool of your choice must be flexible while choosing which objects (users, groups and file server events) to be monitored for focusing on specific cases. Search & Sort – The tool must have options to allow searching, filtering and sorting the audit data. Elaborate Reports – The software must have comprehensive reporting options over daily monitoring, all changes, files, folders, permissions, resources and also allows saving them future reference. 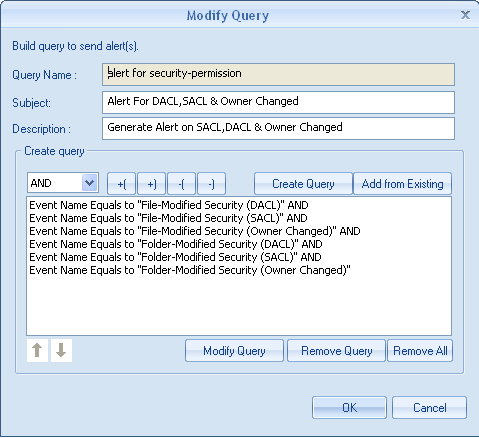 Alerts and Scheduling – Real-time alert generation and report scheduling should never be compromised as only alerts can help to avert damage in time. 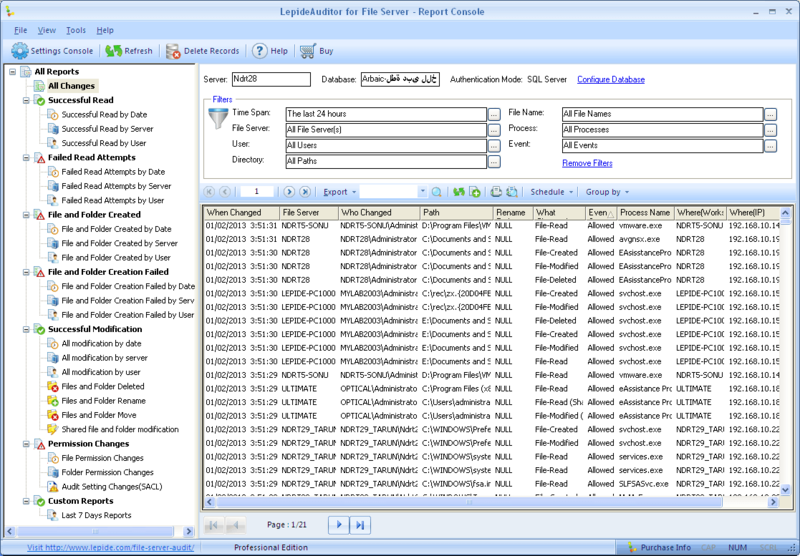 Ensure the tool has maximum alerting options for prompt response such as on-screen messages, email, SMS options as LepideAuditor. Simple GUI – The tool must have an intuitive and easy-to-use interface. We need a tool which can look after bigger challenges and not a tool which itself has to be looked upon.